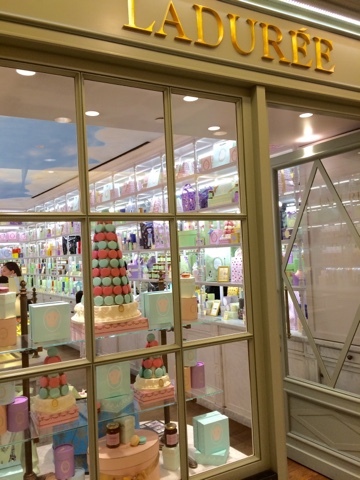 Ever since my first visit to Laduree in NYC, I fell in love with the luxurious French maker of macarons and when I visit a new city, I check to see if it home to a Laduree location. While each location is uniform in the soft green pastel decor and offers a rainbow variety of macarons, I've found some nice distinctions. 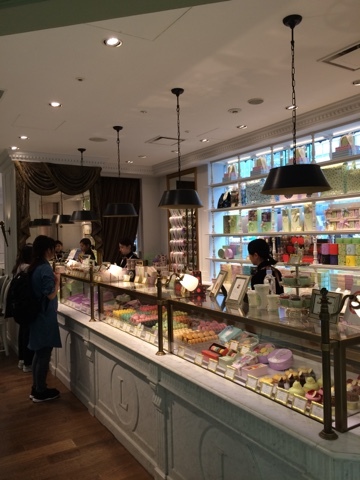 In the Singapore location, there was a special Laduree macaron offered. The chocolate macaron was decorated with 22 carats gold leaf. They advertised that it was the universal symbol of success, beauty and eternity and was known to give a higher IQ, and possesses the legendary powers contributing to a long and vital life. But really, they had me at special. I forked over the $7.90 Singapore dollars which roughly converts to about $6 US dollars and took a bite (after pictures of course!). 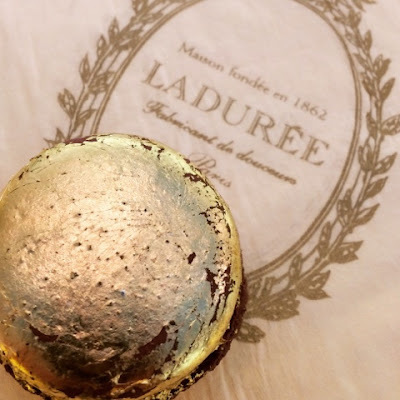 While the chocolate macaron was perfect and divine, I didn't care at all for the metallic taste of the gold leaf. There goes increasing my IQ. As for the Shinjuku, Japan location, I was delighted that they served ice cream! I had a refreshing chocolate soft serve topped with raspberry sauce and raspberry macaron crumble. I thought the macaron would be chewy, but they were crisp and gave my dessert a nice crunch. What a genius idea for broken macaron cookies! 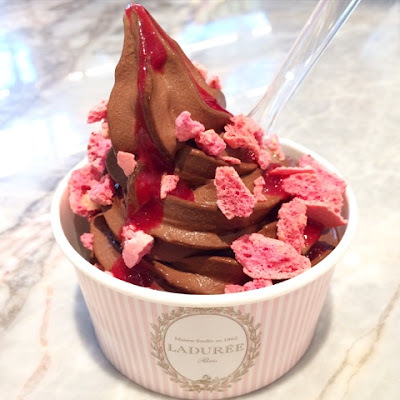 A visit to Laduree is always a treat for my senses and a fun way to indulge. Looking forward to more visits!